Last week was the first of the Battle of the Trenches obstacle course races that are due to take place this year. As much as I would have loved to take part in the event, the team was unable to make it. So we enlisted the help of EtchRock key challenger Ben Pollard to give us a first person perspective! Below is an account of Ben’s experience at BTTT. We arrived at BTTT at 8.45am and decided to stay in the van for a while before heading over to registration, it was pretty cold outside so we wanted to make the most of the in car heating! We headed over to registration at 9am and had our bibs and timing chips by 9.05, safe to say that the process was very straightforward. Then it was back off to the van for a quick top up of warmth and to get a moment to mentally prepare for the run. I was with my best friend and fellow OCR addict Lewis, we have been doing challenges together for a while and got a quick pep talk with each other before we headed back out. At 9.30 we were out of the van and making sure laces were tied tight, tops were comfy and our numbers were fastened securely although I always seem to loose mine within 5 minutes of starting! The atmosphere on the start line is always brilliant with the sergeant major warming us up and giving us the course rules which are be safe, have fun but try every obstacle even if you think you cant do it. He was very enthusiastic and got our minds right for the race. At 10AM and we are off and away, the first part of the race was straight into some small hills and some trenches full of mud and water that absolutely stunk, but hey, that’s what OCR racing is all about! As we got going we managed to get into a good running pace (where possible!) and took all the obstacles head on together as best mates would. It’s great going with a partner, not only to have help on some of the tougher obstacles but also in terms of motivating each other! We had countless hills, pits full of mud and water and other suspect things, I say suspect as it smelt very similar to pig s**t but we couldn’t be sure! 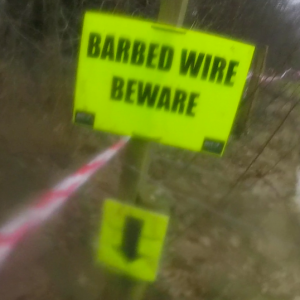 There were cargo nets, logs covered in barbed wire that you has to crawl under without skinning yourself alive and slides over 100ft long that can only be described as bloody brilliant! We covered the first 5k without getting too dirty and started to think ,’This isn’t too bad’! I was quick to discover how wrong we were, the saying ‘save the best till last’ had never been more relevant! We were faced with even more trenches, tunnels and hills that seemed to go on forever! There was even fire as well! The last 2km had so much mud and fun crammed into it, it was truly epic! I would have to say that the toughest obstacle was the rope nets, they can prove very tricky when trying to climb them at speed! At the end of the day this is why you do these extreme mud runs, yes they are extreme and you get battered, bruised and broken down, but they are huge amounts of fun and the sense of achievement you feel when you cross that finish line cannot be described in a only a few words. I would urge anyone to give BTTT a try! 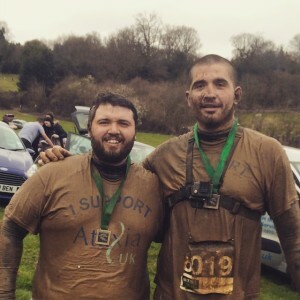 We do OCR’s for ourselves as a challenge but our main reason this year is to raise money and awareness for a fantastic charity called Ataxia UK, they support people with ataxia which is a neurological disorder. After the race you get a fantastic medal, banana and a bottle of water. In our eyes it was all worth it. We hit the showers that were freezing but necessary in order to remove some of the mud, we had mud in places that I wasn’t sure mud could be! So we showered, dressed and got the heaters blasting in the van, we hit the road on a high and couldn’t stop talking about the race the whole afternoon. Overall Back To The Trenches is an extreme mud run that allows people of all levels of fitness to get involved, get muddy and have FUN!! I would highly recommend it to anyone that is interested in OCR! 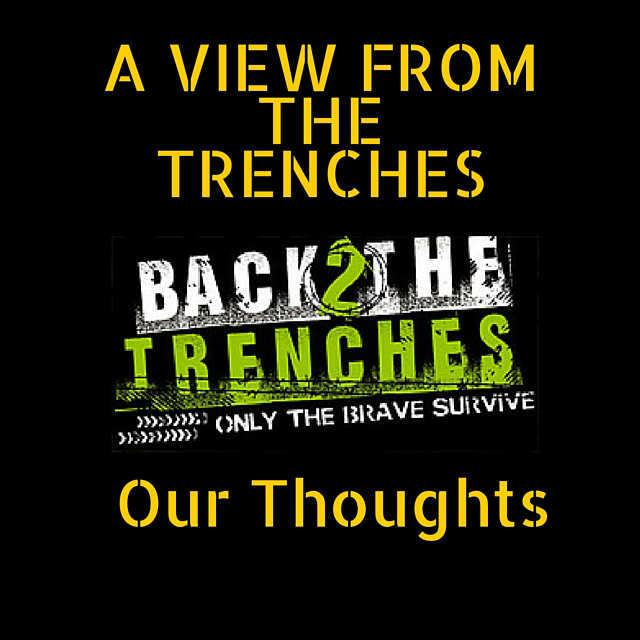 If you want to sign up for the next Back To The Trenches OCR, it is on the 21st June. Follow this link to their website and find a little more about their events! Want to ask Ben about his experience? He is competing in as many OCR’s as possible in training for his 100km run in the summer. Reach him on his Twitter or Facebook if you have any questions for him! Visit EtchRock.com to find your next challenge!